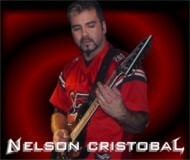 Born in Santiago Chile, Nelson comes from a family of guitar players. Having played guitar for over 17 years, and contributing his chops to many different musical projects, Nelson brings a level of playing second to none. With influences ranging from Metallica and Slayer to Elvis Presley, Nelson fuses all this into some amazing guitar playing.